Do Re Mi Fa Sol La Ti Do! Have you ever wondered what that phrase means or where it came from? Probably not, but read on. You’ll be glad you did! First, let’s talk music theory. This little dollop of theory will be necessary to understanding the history behind it. Solmization is just a fancy word for using sounds or syllables rather than the official names of musical tones and pitches. People have been doing this since the beginning of music really, but each culture has developed its own unique systems and forms that changed over time. Western cultures use the solfege system (also known as sol-fa). This system has been in use for around 1,000 years, but not exactly in its current state. In European-based music theory there are 7 major tones/pitches that are used to create all music. The official names of these tones are C, D, E, F, G, A and B. There are also half-step tones called sharps and flats that fill in the musical gaps, but they are irrelevant at the moment. When the 7 major tones are put in order from lowest pitch to highest it becomes a scale, also known in hard-core musical theory circles as a gamut (from the Latin phrase gamma ut). The C scale (the first and most basic scale, which does not use any sharps or flats) begins on the C tone and ends on a C tone an octave higher. Solmization gives each of these tones its own unique syllable. So the sol-fa system goes like this: Do (C) Re (D) Mi (E) Fa (F) Sol (G) La (A) Ti (B) Do (C). The purpose of using syllables rather than proper names of notes is to learn vocal pitch and musical intervals, which come in handy when sightsinging. *Note: There are two ways of using the sol-fa system: 1. Fixed Do, meaning Do is always on a C. 2. Movable Do, meaning Do begins on the first note of whichever scale that you are singing (there are many). For the purposes of understanding the history of music theory let’s pretend that it is always a Fixed Do, which is how the system began in the first place. So now that you know what solmization and solfege/sol-fa are, let’s talk about where they came from and why anybody even cares. Guido Aretinus was born in France sometime between the years 990 and 995. Let’s say 991. In Guido’s world, music was basically split into two genres: sacred (church) and secular (dances, minstrels, etc.). As a child he certainly would have heard plenty of music, whether it was the upbeat folk dance tunes played at the local festivals or the other-worldly Gregorian chants used in the cathedrals. Perhaps he heard his mother humming a tune while doing the laundry or making dinner? Who knows how early his love for music began. Very little to nothing is known about his early life. Regardless, It is doubtful anyone could have predicted the impact Guido would have on the future of musical theory and notation. At some point before 1025 he became a Benedictine monk in a monastery near Paris. The Catholic church held more influence over European society than just about anyone at the time so monks (and nuns) were revered and respected. Clergy were highly educated and were the only members of society at the time who were professionally trained in music. Everyone else in medieval Europe just taught themselves or learned by ear. Only very select people have been known to write both sacred and secular music. Secular music at this time wasn’t even written down because there wasn’t a way to notate the instrumental parts. Some texts and poems survive, but anything written and performed outside the confines of the church during Guido’s life was only passed down through oral tradition. Guido was a choir director. He found his job to be a bit stressful early on since he could only teach his choir the chants and hymns if he had already heard the melodies beforehand. If he was assigned a new chant to sing for a specific holiday or mass he had to arrange for someone from another city or monastery to perform it for the singers before they could even learn it. Learning and teaching songs this way was complicated and not very efficient. Songs had to be sung in a specific way, in a specific order on specific days (according to the ever-changing liturgical calendar). When singers only have the option to learn songs from each other it leaves a lot of room for individual interpretation and personal preference, which wasn’t necessarily a good thing. Now this issue didn’t arise from the melodies not being written down. Most sacred songs were notated in manuscripts at this point. But the notation only indicated phrasing, not pitch, which was certainly better than nothing. Pitch was indicated (kind of) by placing one neume slightly higher or lower than the other, or above and below a line (indicating high voice and low voice for polyphonic songs). Neumes are the little markings that became the musical notes we know today. 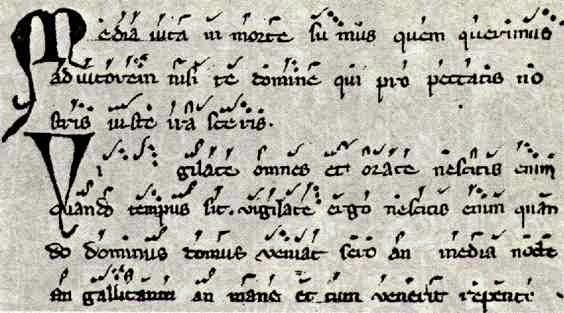 Music manuscript with neumes over text. http://muswrite.blogspot.com/2014/12/orff-carmina-burana.html. Guido thought this system was confusing and ridiculous. So he developed a new one. It was pretty crazy, but it worked. Not only that, but he decided to teach his students the tones and pitches with a form of solmization he developed using an old hymn about St. John the Baptist. He noticed that the first phrase began on C and each new phrase began one note higher on the scale. At the time, sacred music only used 6 tones. He called them ut (C), re (D), mi (E), fa (F), sol (G), la (A). Turned out that Guido’s innovations didn’t win him any friends at the monastery. According to him, the other monks were jealous and forced him out of Paris. He was sent to Pomposa, Italy, where he again found nothing but trouble from the other brothers regarding his unorthodox teaching methods. Between 1033 and 1036 he asked to be sent to the monastery in Arezzo, Italy, where it is presumed he remained for the rest of his life. Hence his new title: Guido d’Arezzo. In Arezzo, Guido perfected his new notation system and found great success with and support for his choral instruction. For the first time ever, singers could be given a hymn and sightread it. Singers in Italy could sing the same version of the hymn as those in France and they could do it quickly and accurately! This was an exciting event to be sure. Opposition to the innovations eventually waned because, well, they worked. News spread about Guido’s work and his fame earned him the personal approval from Pope John XIX himself. The Pope was pleased with the new notation system that allowed him the ability to decipher and learn the hymn melodies without help. Music was forever changed and thanks to Guido, this change enabled countless musicians and composers after him to develop entirely new styles of music and preserve their melodies for generations to come. So how did ut, re, mi, fa, sol, la become do, re, mi, fa, sol, la, ti, do? The short answer is that as time passed new styles of music had different needs. 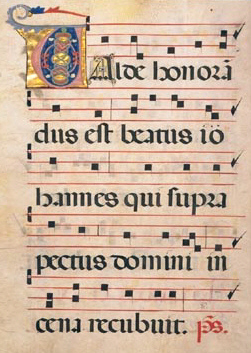 Another tone (B) was added to sacred music once chant music became a bit more complex sometime before the 1200’s. It wasn’t until the 1600’s that B earned itself an official name in the sol-fa system. It was called Si (the Italian initials for Sancte Joannes in Guido’s hymn above). Ut was changed to Do because it was easier to sing for pretty much everyone but the French. Do was added at the end to complete the scale. It sounds nicer that way. Si was changed to Ti in the 1800s by Sarah Glover, a highly successful singing instructor in England. She thought it was better that every syllable in the system start with a different letter. Apparently the musical powers-that-be agreed. Si, however, is still used in some places. Do, Re, Mi, Fa, Sol, La, Ti, Do!